Traditional Baptism in the name of Jesus Christ with water and oil. This Baby Blessing Ceremony is a Christian Baptism that includes an Anointing of Oil element as well as the Candle Lighting element. 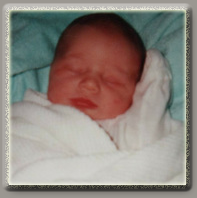 This Baby Blessing puts an emphasis on Jesus Christ. You may choose this ceremony just as it is written, or use my unique Build A Ceremony Menu to customize it to your wishes. Dearly beloved, we are honored with the privilege of being present here today to witness and support in faith the christening of ______; the son of ____ and ____ born into this world on ______ ____ 201__. You have been invited here as family and friends and your prayers and spiritual support in ______’s life have been requested. It has been said that in a Christening, Heaven comes down and surrounds the child with God's love for which the effect is lifelong. We join our thoughts and sincere goodwill, asking that Christ's peace might embrace this family and an arc of God's light surround ______ for all of his days. This event is shared, if in a different way, by those who have passed beyond this life. Their roles in the lives of _____ and ___ are gratefully remembered and honored as we come together for this joyous event. They acknowledge and honor the bloodlines, the history and the people who have all gone into the creation of _____ . They remember what it felt to be with these loved ones, and that through shared memories _____) may come to know his/her ancestors and the lineage that is his/her birthright. 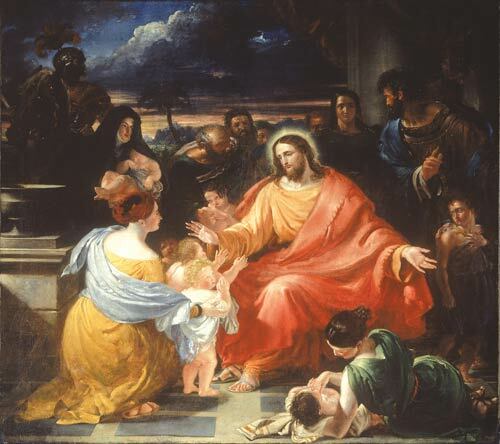 “Let the little children come unto me and forbid them not; for the kingdom of God belongs to such as these." 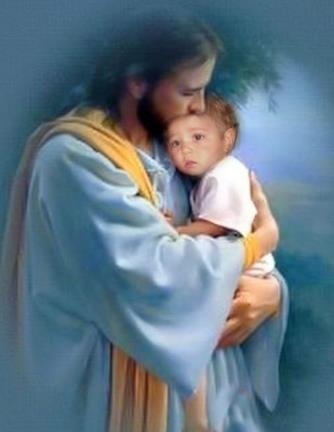 Our Lord and Savior Jesus Christ instructs us that all should come to faith with the eyes and heart of a child. Today, we dedicate ______ to Our God in this Christening. In Jesus Christ, we are set free of the punishment of sin and oppression of law. By grace in faith we are forgiven and assured eternal life. Jesus gave unto us two great commandments, which we should strive in heart and mind to obey. Both are of Love. To love God with all our hearts, and to love others as we would have others love us. These two things our Lord and Savior Jesus Christ commands of us. ___ and _____ will you teach ______ the truth that from this moment he may realize his unity with God and of Christian doctrine, the gospel ministry and of the salvation by grace through our Lord and Savior Jesus Christ? Will you try to conduct your own life so that by both word and example, ______ may learn to live joyously and harmoniously with Christian principle and the assurance of salvation - will you strive to do this to the best of your ability? _____and _____, as Godparents to ______, God will give you the wisdom and ability to hold within your heart forever his spiritual welfare. You are charged with the responsibility of seeing to the spiritual welfare of this child should the need arise and it is you who stands as spiritual counselors. Do you accept this duty and charge? Do you promise to love, honor, support and encourage ______ throughout his life? Officiant to parents: What name have you chosen for this child? Parents answer: ______ _____So be it. Here in the presence of loved ones, we christen you ______ ______ in the name of the Father, the Son and the Holy Spirit. Amen. 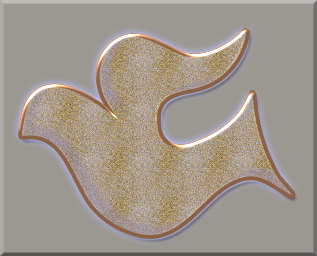 I christen you that you may know the pure and holy spirit of God, your eternal source of faith. May you come to know God within your heart all the days of your life and express your highest potential in Christian service. Baptism is a visible symbol of God's saving work within a person. It is the outward sign of belonging to the people of God. Through baptism we are incorporated into God’s mighty acts of salvation, and given new birth through water and the Spirit. Baptism is sometimes called an “ordinance,” meaning it was “ordered” in Christ’s teaching and example. It is also referred to as a “sacrament”, from the Latin sacramentum, meaning “sacred.” We believe that God’s grace is bestowed in the partaking of the act. Romans 6:3-6:6 tells us that through baptism we become like him in death and life. 1 Corinthians 12:13 declares that we were made part of one body through baptism. I baptize you ______ _____l in the name of the Father; In the name of the Son; and in the name of the Holy Spirit; Amen. So beautiful and poetic are those phrases from John 3:8, they are the words of Jesus, when teaching Nicodemus about being “born again”, which to me means that we “die” unto ourselves, we let go of resistance of the things we wish were different and just trust God. A broader context relates to baptisms and the symbolism of the water as well. Almighty God, unto whom all hearts are open, all desires known, and from whom no secret is kept, we place ourselves under the guidance of the Holy Spirit. Grant us and this child now dedicated to you, our Lord God and Heavenly Father, a clear understanding of the duties and obligations we now assume. We pray for the care and protection of ______ in body and soul. We surrender him to your hands. Please, Dear Heavenly Father, bind your angels to bless and attend him always. May his heart grow strong, may he love patiently, and may he do what is good and holy in your eyes. This we pray in the name of our Lord and Savior Jesus Christ. Amen. ______, as a child of the covenant, receive this blessing. In Baptism you are sealed by the Holy Spirit and marked as Christ's own forever and ever. Amen. Throughout the Bible, Old and New Testament, anointing with oil was an act in recognition of wealth, prominence, inheritance and position. Yet in the anointing of Christ before his death on the cross, we were shown the true measure of possession, inheritance and wealth is not found by worldly measures. ______, having now been dedicated into the Kingdom of God, Your family and I will now anoint thee with all the wealth you now possess as one in the Kingdom of God - the power and majesty of our Lord God; the unlimited and sacrificial love of our Lord and Savior Jesus Christ, and the spiritual wisdom and assurance of the Holy Spirit; and of your great inheritance - life everlasting in the paradise of heaven - of perfect peace, harmony and joy. No man or woman could possess more than this. Officiant will anoint Child’s forehead- In the name of the Father; of the Son; and the Holy Spirit; Amen. Then the Godmother, then Mother will pass Child to Godfather then father, will anoint Child in the name of the Father, of the Son; and the Holy Spirit. You can have two candles just Godparents or four candles Godparents and parents. 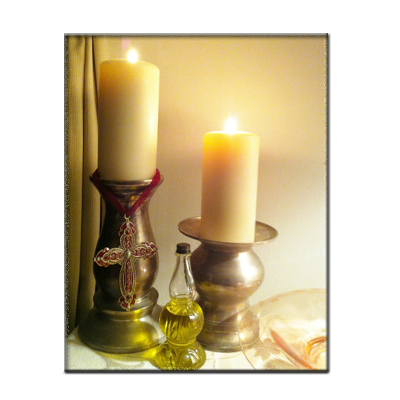 In Christian worship traditionally, the lighting of candles has many spiritual meanings. The light of candle represents the light of a person's life. The flame represents the eternal truth of God. The light shining forth represents God's truth shining forth upon the world. For believers to collectively light a candle, represents the sharing and fellowship of faith; and traditionally represents the unity of the individual believers with Christ and the body of believers of Christianity, both in this world and in heaven. I ask each Godparent and each parent to take one of the candles and light this candle. Then, together, light the center candle for ______, as the light of his life. I ask that at the conclusion of this service, each of you keep your candle for this reason: Should there be a time in ______’s future for which he faces difficult times of trial, or be called upon to make grave decisions - of hardship or joy, or become lost in spirit - you should, as the duty and obligation you have assumed today - find a quiet place alone to yourself. Light this candle or another and through pray ask for the safekeeping of ______ in both body and soul from our Heavenly Father, the revelation of grace and salvation of our Lord and Savior Jesus Christ, and the spiritual guidance of the Holy Spirit. ______, from this day onward, no matter how dark the world may seem nor how alone and lost you may feel, you shall never be alone again, never without hope or assurance of final victory. Lift his Countenance unto you and give you peace. I use a traditional scallop shell to pour the water over top of the child’s head. The scallop shell is the symbol of baptism and is a common symbol of Christianity. It is believed that John the Baptist used a shell to pour water over Jesus when baptizing him. The Scalloped shell is a symbol that is used throughout Christianity representing the living and moving water of baptism, which blesses our living and moving in the Holy Spirit. Baptism is not just about accepting ones beliefs, but of committing oneself to a way of life, recognizing oneself as a child of God, serving in the name and way of Jesus. The anointing of oil dates back to the early Christian Church and is still included in most Christian ceremonies. 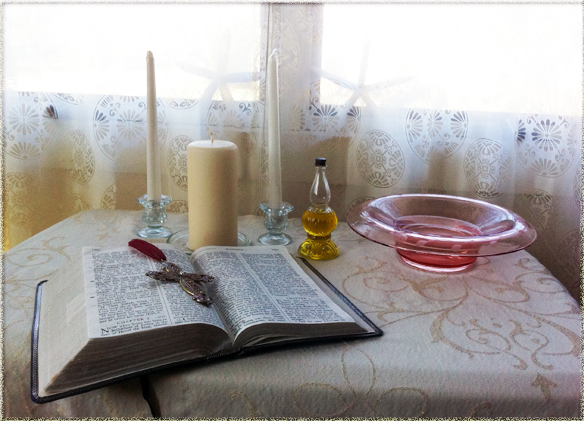 Anointing with oil is in both the Old and New Testament. The wise men brought 3 gifts to Jesus- gold, incense and anointing oil. Jesus was both baptized and anointed with oil in the Bible. In ancient times, fine oils were a symbol of wealth and also could be used as money. Only the wealthy could afford the finest of oils - pressed from various plants, olive the most common. The poor only had animal fat and the very poor had nothing. Thus, to be "anointed" was a sign of prosperity. In spiritual terms, anointing with oil is a declaration of spiritual wealth. With Baptism/Christening, the person is becoming a citizen of the Kingdom of God that person now is wealthier than any worldly king - even if the person's life is of poverty and difficulty - as the person is assured of eternal life in heaven. This is why the anointing with oil is after the Baptism/Christening. After the person has been dedicated into the Kingdom of God they now possess all the wealth any man or woman could possess. The oil symbolizes this. Most people include the traditional anointing with oil in the Christening ceremony, however it is not required.